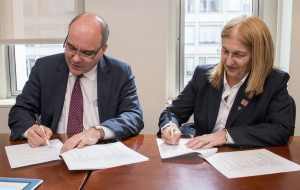 During the World Bank Conference a new MoU was signed, and President Potsiou also paid a visit to the US member association of FIG, NSPS. VP Dumashie attended a Gender Roundtable. FIG President Chryssy Potsiou and FIG Vice President Diane Dumashie attended the annual World Bank Conference on Land and Poverty, held in Washington DC, 14-18 March, 2016. 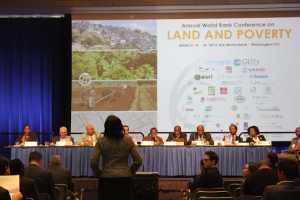 Now in its 17th year, the annual World Bank Conference brings together key stakeholders from governments, civil society, academia, the development community, and the private sector to discuss land policy design and implementation, impact evaluation and progress monitoring. The opening Session included welcome remarks by Asli Demirguc-Kunt, Director, World Bank, opening remarks by Laura Tuck, Vice President for Sustainable Development, World Bank, and a very interesting keynote speech by Paul Romer, Professor of Economics, at the New York University. This year’s theme ‘Scaling up Responsible Land Governance’ paid special attention to working in all aspects of land at scale, to mainstream thematic issues, identify innovations, and sustain investments in land governance. The conference opening presentations all signaled the importance of land in the emerging Urban Agenda of Habitat III, the keynote speaker Paul Romer, Professor of Economics, at the Stern School of Business at New York University raised the importance of a realistic policy approach for growth and shared prosperity to urban expansion, with the provocative message “Let people come, and they will build”.The annual conference includes three days of parallel sessions across the range of land professional activities including: spatial data, country case studies, community land, implementing good land governance at the global scale, valuation, land urbanization processes and water resources. Noteworthy were sessions and papers that embed the issues of equality for men and women to access land. The conference continues to grow each and every year, becoming an important event to meet and deliberate with a diverse group of people and organisations all involved in Land. In the spirit of the multi-diversity of the audience, the closing plenary involved concluding remarks from the World Bank; Ede Ijjasz-Vasquez and Kaushik Basu, and a leading NGO, Esther Mwaura Muiru from GROOTS Kenya. The President gave her presentation about her personal research on the recent structural reforms accomplished in Greece and their impact on the local real estate market. 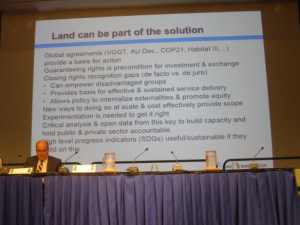 www.conftool.com/landandpoverty2016/sessions.php She also participated to the pre and post-conference sessions and MasterClasses, on FAO LGAF and the various GLTN tools especially COFLAS and FFP Land Administration. 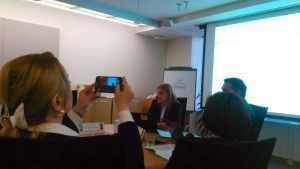 Following the WB conference President Potsiou participated to the GLTN IAB meeting. In addition Vice President Diane Dumashie attended the pre-conference roundtable on Gender, Rights to Land and the SDGs contributing knowledge and experiences from both the FIG activities as well as her contribution to GTLN’s Gender Evaluation Criteria initiative. She also held a number of meetings with FIG partners. During the Conference and with the valuable support of Daniel Roberge, FIG former Commission 7 chair, who served as Senior Land Administration Specialist at the Global Land and Geospatial Unit of the Bank, FIG President Potsiou and Mr Ede Ijjasz-Vasquez, World Bank Senior Director of the Global Practice on Social, Urban, Rural and Resilience (GP SURR) signed a renewed MoU between the World Bank and FIG. The signing of this MoU will lead to closer cooperation in carrying out activities conducive to fostering knowledge sharing, information dissemination, training and capacity building in land administration and management in the developing world. The objective of the MoU will be advancing the achievement of strengthening property rights and improving households’ security of tenure, improving functionality of land market, and improving time, cost, and land access issues. Importantly, the Global Land Tool Network (GLTN) launched its Guide for Fit-For-Purpose land Administration, authored by FIG Honorary President Stig Enemark, Robin McLaren and Chrit Lemmen. With three sessions and an additional master class to take fit- for purpose to scale, the stage was set for a range of presentations and discussion on this subject, including the guiding principles and the implementation model. The final publication will be launched at the FIG Working Week in Christchurch. 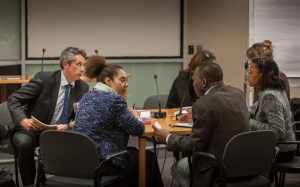 The development of costing and financing land administration services (COFLAS) undertaken by FIG colleagues also contributed and complemented to the wider debate. 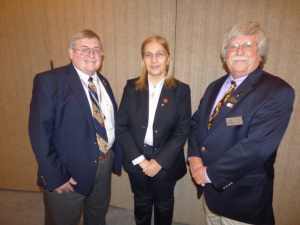 While in Washington she was invited to meet with the Board of Directors of the National Society of Professional Surveyors, the American member of FIG. 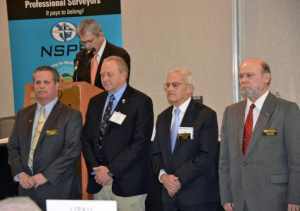 She was enthusiastically received by the Board and John Warren, NSPS President, during the NSPS National Surveying, Mapping and Geospatial Conference in Arlington, Virginia. She also met with, and was interviewed by Neil Sandler, Publisher of xyHt Magazine and David Doyle, Geodesy Editor of the magazine. 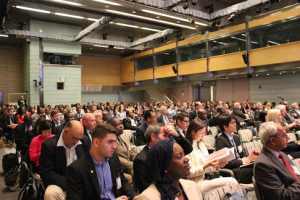 The event took place at the World Bank Conference at Monday, March 14 : 1:30 - 4:00 PM and was co-organized by World Bank, GLTN, FIG and the OGC. Involvement of GLTN is crucial – the network contributes the requirements. UN-FAO, UN-Habitat, UN-GGIM and other UN agencies are welcome to get involved. Organiserswere Arnulf Christl, Metaspatial, Christiaan Lemmen, Kadaster, Athina Trakas, OGC, Pauline van Elsland, Kadaster, Kees de Zeeuw, Kadaster NL. Most people-to-land-relationships worldwide are not recognized nor identified or documented. Existing land administration systems are incomplete and do not perform. Alternatives are needed. The Fit for Purpose (FFP) Land Administration approach provides a new, innovative and pragmatic solution to land administration. There is need for a solution that is directly aligned with country specific needs, is affordable and flexible to accommodate different types of land tenure, and can be upgraded when economic opportunities or social requirements arise. The approach is based on a set of principles for building institutional, legal/regulatory and spatial frameworks. Low cost approaches are promoted. The event on Building Infrastructure and Services for Imagery Based Land Administration discussed the requirements and the options for business models and provides an insight to the topic for industry. 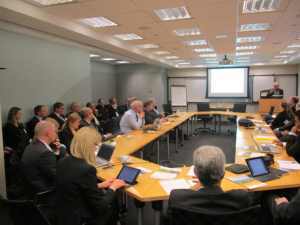 Infrastructure, services providers, software developers and academia were be invited to discuss a first draft strategy on how to address the challenges of integration administrative with geospatial data. This includes the organizational and technical options for land rights recordation based on a minimal dataset related to the developments in reference systems as supported by those providers. There are challenges in relation to the inclusion of spatial units for land administration linked with legal/administrative data on land use rights and right holders. Administrative attributes are still mostly “out of scope” for the broader geospatial industry. This needs development. Open geospatial standards are available but need to be promoted in the context of land administration. OGC decides on the establishment of a Domain Working Group for Land Administration during its meeting in June 2016. Question is if there should be a new WG or if the issue should be related to an existing WG. In any case it seems that OGC has the Land Administration on its Agenda. ISO 19152 LADM will be considered as the conceptual model.